CAIR Is Not FInished with Judge Jeanine - Radical Muslim Group Is Out to DESTROY Her - Harasses Hospital to Rescind Award -- DON'T LET THEM WIN! 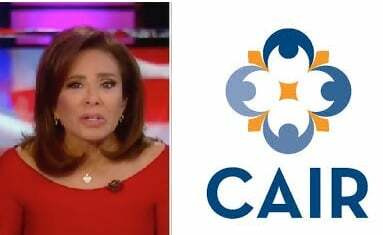 CAIR Is Not FInished with Judge Jeanine – Radical Muslim Group Is Out to DESTROY Her – Harasses Hospital to Rescind Award — DON’T LET THEM WIN! Last Saturday FOX News Channel cancelled the Judge Jeanine Show after Judge Jeanine attacked radical Muslim Rep. Ilhan Omar (D-MN) for her outrageous anti-Semitic comments in recent weeks. Judge Jeanine asked the question whether Ilhan Omar puts Sharia Law before the US Constitution. No one has bothered to ask Ilhan Omar if this was a true statement? The Council for American-Islamic Relations (CAIR) led the campaign to get Judge Jeanine Pirro off the air. CAIR is a noted un-indicted terror co-conspirator and hate crime hoax spreaders. FOX cancelled Judge Jeanine for at least two weeks. Sources told The Gateway Pundit that FOX News hosts secretly worked to get Judge Jeanine suspended. Bret Baier has since refuted the allegations. But CAIR is not finished with Judge Jeanine Pirro. They are out to destroy her. CAIR is calling on radical Muslims to bully St. Barnabas Hospital to drop Judge Jeanine as an awardee. Michelle Malkin is calling out American patriots to defend Judge Jeanine from ongoing CAIR attacks. Michelle Malkin put out a MALKIN ACTION ALERT: Contact St. Barnabas Health System and ask them NOT to pander to un-indicted terror co-conspirators and hate crime hoax spreaders. CAIR's sowers of division thrive on violence whether Muslims are victims or perpetrators. They claim “backlash” if jihadists strike. It’s always our fault, our responsibility—to curtail speech, give up #2a rights, undergo sensitivity training, apologize for everything. Enough.